We developed this approach with recognition that there is a great deal of variation among Australian NRM groups; as such, it supports the integration of climate change adaptation into planning regardless of the current style or stage of planning. By focusing on five general components of planning, this guide will be relevant regardless of the specific planning approach. The components reflect an iterative planning process that is also appropriate for planning for climate change. This is because the most effective responses to climate change risks may not be known and outcomes may only be achieved after trying a range of options, assessing the responses, and adjusting those responses. It is designed to support self-assessment; NRM users can consider how well their current processes meet many of the challenges that will arise due to climate change, what adaptation might be required, and how some processes might need to be adjusted to incorporate adaptation into planning. The table below summarises how each stage of planning might be different under an adaptation lens. For a more detailed look into the components of planning, including examples of how they have been applied in natural resource management, download The NRM Adaptation Checklist. Why might assessment need to be different? Why might strategic planning need to be different? 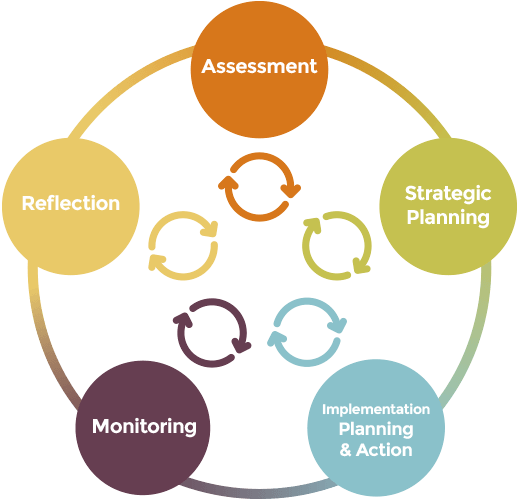 Why might implementation planning and action need to be different? Why might monitoring need to be different? Why might reflection need to be different?